I love salad bars. They were my favorite type of restaurant when I was younger. I loved having so many items to choose from, to fill my plate. And now, my two daughters also love salad bars. We do something, here at our house, to replicate that restaurant salad bar. I've created a constantly changing salad bar in my fridge. There's the basis for most salads, the leafy greens. I'm trying to keep the salad spinner filled with leafy greens from our garden, all washed, torn and ready to eat. 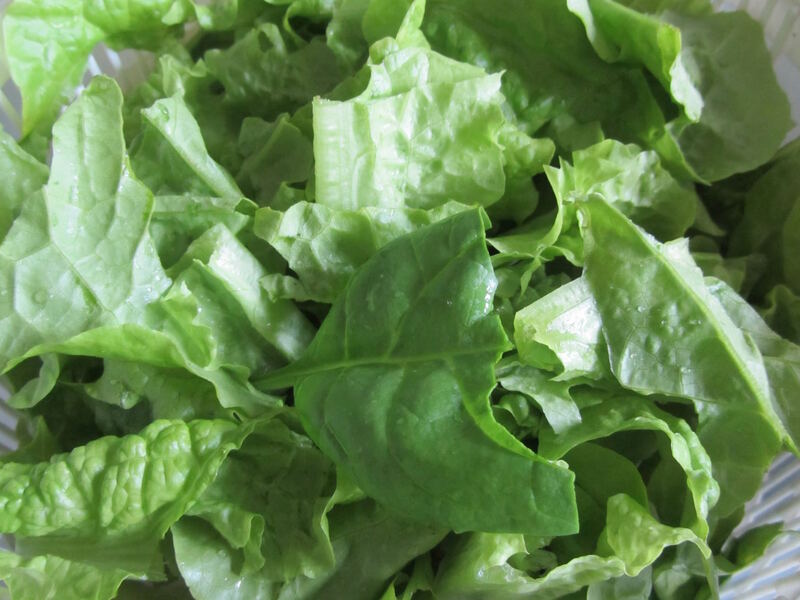 This week, is a combination of green leaf lettuce and baby spinach. If the greens are ever all taken for the day, everyone in the family knows they can simply go out to the garden and pick a few leaves. Then there's all of the toppings. It changes from week to week. Sometimes it incorporates leftovers that need using. That last little bit of cooked veggies, stale bread made into croutons, an open jar of pickles or some olives. I try to keep a couple of protein sources in there, too, like cooked garbanzo beans, peeled boiled eggs, shredded cheese, or toasted nuts or seeds. And lots of raw veggies, like shredded carrots, tomatoes, sliced cucumber or celery, shredded cabbage, or radish slices. And sometimes, I add some chicken salad, turkey salad, potato salad, pasta salad, 3 bean salad, or egg salad. For a long time, the salad bar ingredients were rather haphazardly kept in various parts of the fridge. This year, I finally got smart and corralled them all in a plastic, easy to wash, lightweight to lift, but sturdy to support and hold, shoebox. Family members can simply grab the salad bar box, the salad spinner of greens and the dressing. I keep most of the ingredients in glass or plastic jars (see-through is the key to get those items eaten), and items like the croutons and nuts/seeds in ziploc baggies, resting on top. I keep at least one bottle of homemade dressing next to the salad bar in the fridge. Having all of the ingredients washed, peeled, chopped, sliced or mixed, and ready to use, makes for very easy to throw together snacks and lunches. It's a great way to make sure we're grabbing healthy stuff, using what's in the garden, and taking care of leftovers. And then, towards the end of each week, I can use up those stragglers, the last odds and ends, in a pot of soup, or a large salad for the family. This week's salad bar has leafy greens, shredded carrot, sliced celery, sliced olives, cooked garbanzo beans, an open jar of mild pepper rings, peeled boiled eggs (they're more likely to get used if I peel them), shredded cabbage, whole wheat croutons and sunflower seeds, with a dressing of homemade vinaigrette. Lovely, as usual! I also always have salad fixings in the fridge though not as organized as yours. But easy to find since my refrigerator is almost always close to empty so it is easy to find the fixings. I do like the idea of jars with fixings. I also have two jars of homemade salad dressings always available. I do need more recipes but I want light, light, light oil since I don't like oily things. Also I like only a little bit of tart so a very vinegary one wouldn't work. I like homemade french, homemade thousand island, ranch but I would like to add more selections. It's a busy day today extending into the early evening so maybe a big salad for dinner when I get home sounds really good. Homemade croutons are a big hit at home but I rarely have leftover bread to make them. 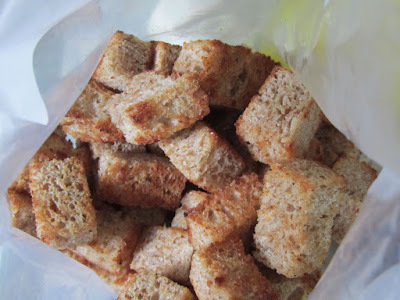 I should deliberately use one of my homemade breads to make a batch of croutons. It's hard to have much leftover bread around here, too. We've found that stale homemade bread is very good when toasted, so even the old bread that I'll think will make good croutons when I get to it, is often gone before I can make them. But I will take a few thick slices off of a loaf that's been sitting in the pantry for a few days, for croutons. So long as the bread is not super fresh, I think it makes good croutons. And I think homemade bread makes better croutons than commercial bread. Alice, somewhere on this blog is a recipe for rhubarb dressing. You might like that. It's sweet and tangy, not just tart. And it's a great way to use surplus garden rhubarb, if you can get any. It will only keep for about 1 week to 10 days in the fridge (because of the rhubarb pieces). But it's a nice change of pace. If you do try it, let us know what you think. I like it on spinach salads, myself. Hmmm, I'm thinking I'm going to make some today. Love the idea to prep once and corrale the ingredients into one spot. Once the garden is rolling it's growing faster than we are preparing it. A salad bar might help! I know. We reach a point in the garden where the washing and trimming of all that it's producing becomes a daily chore. I like the ease of going out there every 2 to 3 days and doing a larger harvesting and cleaning, to get us through a few days of salads. And it does help us use what is there. This is a great idea! 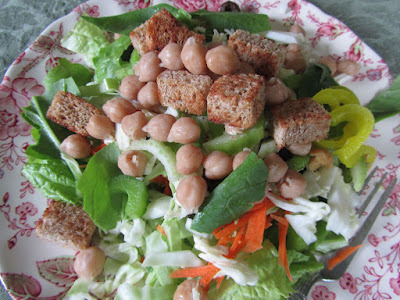 I love salads, but as the week goes on I grow more weary, and am reluctant to take the time to prep salad fixings. Maybe I'll try taking a little time on the weekend to prep everything for salad fixings for the week. That should work really well for us. Thanks for this idea! I've been wondering how long you keep your homemade salad dressings in the refrigerator. My homemade french and ranch dressings never last long enough for me to wonder how long they will keep. The homemade vinaigrette type dressing that I love the most, though, is not as popular with my family, and tends to linger in the refrigerator a little longer. I did some googling last week, and couldn't really find a definitive answer. One opinion is that most vinaigrette dressings don't even need to be refrigerated, unless garlic is added. Other opinions vary from keeping dressings in the refrigerator for a couples of days, to a week or longer. The dressing I make has olive oil, apple cider vinegar, sugar and ground mustard. None of those ingredients alone need refrigeration. I always store it in the refrigerator, though, and try to use it within a couple of days. The dressing solidifies somewhat in the refrigerator, so I let it sit at room temperature for a few minutes before I want to use it, and then give it a good shake. I'm not sure how long I'm comfortable with using it after it's been made, though. Would you mind sharing your thoughts on vinaigrette dressings and storage/refrigeration? In your vinaigrette, the only item with a more limited shelf life is the oil. And even so, it can take months for vegetable and olive oil to become rancid. The vinegar, sugar and mustard are all natural inhibitors for mold and bacteria. I would guess that your homemade dressing would stay "good" for several weeks, up to a month. The only issues I've had with storing open containers of homemade items which otherwise store for months, when sealed, is exposure to air and contamination (from unsterilized containers or utensils). If you want to store this for a full month, make sure you sterilize the jar before pouring the dressing in. And I'd think you'd be good to go. Use a Sharpie pen to date the jar. Then in that last week, if it's not all used, you can add it in small amounts to homemade soups, or use it to marinate potatoes before adding a creamy dressing for potato salad, or add to a pasta salad. When I make bottles of vinaigrette, we use them within about 3 weeks. I don't use fresh garlic, but will use garlic powder, onion powder, herbs and spices. And I always store it in the fridge. Thanks for sharing the info about storing vinaigrette dressings! Great tip about sterilizing the jar if I want to store the dressing longer. I hadn't thought of that. Wow, Lili! What a brilliant idea! Love that! Very practical. I usually do mixed chopped salads, and we eat them until they're gone. (Usually by the third day.) If anyone doesn't like an ingredient (celery, usually), they pick that out. Nice to have no prep, and just be able to dump some into a bowl and eat it. But keeping things separate so folks can have just what they want--and so different things that do stay fresh could be used longer, or more perishable things used up faster-- would be really nice! There doesn't seem to me to be anything in your recipe that wouldn't last a week or two easily in the fridge. Even if you had a few "fresh" ingredients (pressed garlic or minced onion), seems like you're basically pickling it, and we've eaten refrigerator pickles a couple of weeks after we made them. The oil solidifying IS sort of a hassle, but we do what you do. And I actually store all my oil in the fridge because it seems to stay fresher. One of the bonuses to keeping the items separate is, as you say, the more perishable things don't contaminate the better keepers. I can keep an eye on the items which would get squishy/slimy after a few days, and use them in something else, and the rest of the salad can go on, as is. I keep the bulk of my olive oil in the fridge, too. I pour a little into a dark glass jar and keep in a cupboard, away from the heat of the stove, then refill as needed. But the large bottle stays in the fridge. When I need more, I allow it to sit at room temp for about 30 minutes, and then it's pourable. This is great idea, I am going to try it out this week. We love fresh salad,but I admit some days the though of all of the preparation results in some lettuce/spinich ect on a plate. Thank you for the idea! At the end of the work day, getting everything together to make a big salad does seem like such a huge effort, doesn't it? For me, it really helps if I have items already prepped to toss in with the lettuce. I'm more likely to add a salad to dinner, by doing this. Plus, all of us are more likely to make salads with our lunches, or as snacks. I hope it works for you, as well! We go through various phases in how we eat salads. Sometimes we do as you do and keep different toppings prepared, sometimes we make a big salad to last for several days, and right now we make a fresh salad every night. All methods have their advantages and disadvantages for us. With only two of us now, one of which will only eat a salad if it is put in front of him, making individual ones each day seems to be working best. However, keeping snacks readily available in an easy to see spot is a good idea. I used to do this with the kids when they were little, but I think it would be a good idea to go back to that. Ward and I don't always choose the best snacks either often because they require some prep (or he can't seem to find them.) Your prepared salad fixings have given a good reminder about that. Eating healthy snacks is not always easy for me. If there are cookies or a quick bread around, I'll tend to reach for those instead of fruit or veggies. So keeping salad fixings all ready in the fridge does increase the likelihood that I'll choose healthier snacks. In fact, just having any sort of ready-made, healthy alternative for snacking is always good for keeping me on track. Lost my comment yesterday because I turned off "allow cookies from third parties" to get rid of an annoying site (homesteading video site) that kept popping up every time I opened silk browser on my kindle fire HD...grrr. very irritating, so I have to do that sometimes to lose the site, but then all sorts of funny things happen at other sites when I forget to turn the allow back on. I think we do a half salad bar, keeping certain ingredients out of the big salad bowl, like tomatoes, croutons, sprouts, salmon/tuna flakes, deli meats, fresh mushrooms, cheeses, boiled eggs, beets and other ingredients that are either too wet or dry that may contaminate each other when mixed too long, since we keep our salad bowl in the fridge for a couple days. 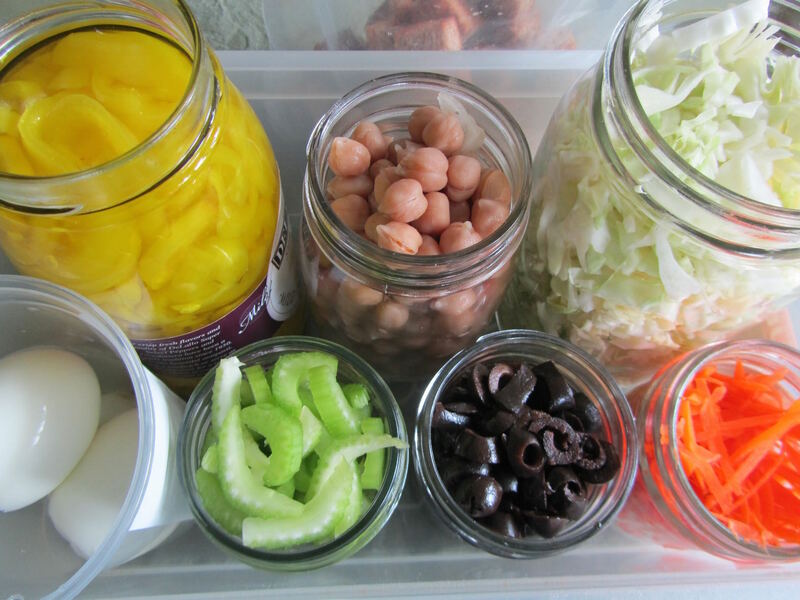 Good idea holding the toppings in jars that fit well in a shoebox. I might try it when the grandkids are over to encourage individual salad making, since we found out they eat better when they can serve themselves. I routinely heat my jars in the microwave to kill a few more germs than normal hand washing. It seems to prolong the refrigerator life of its contents, so we rarely have to think about spoilage. Since reading Creative Savv, I must say I'm getting better about using every bit of food up, including finding creative ways of using canned liquids, cooking liquids, etc. Before throwing away, I will think hard how I can use it for another dish. With gelatin making, that's one more opportunity to use up, like opening a new frontier lol. Yesterday, we bought a hand immersion blender at Salvation Army for $2.50. So I'm anxious to try it on turning a few extra ripe papaya (bought bargain priced) into gelatin. Many thanks to you, Lili!! I haven't tried microwaving jars to sterilize them. Do you fill them with water? That's a great idea, and much less work than getting out a stock pot for sterilizing. For the papaya gelatin -- are you going to heat the papaya to denature the enzymes? I don't know what temp you need to heat papaya to, but with fresh pineapple, you need to heat it to at least 167 F degrees to denature the bromelain, so the gelatin will set. Good luck with the papaya gelatin! It should be a yummy treat. For heating the jars, I simply rinse the jars and pop it in the microwave about 2 minutes. The jar gets very hot, so that's just extra insurance that a few more germs are killed, though not entirely germ free as with sterilization baths. For sprouting, I find I can reuse the cheesecloth by heating it up in the microwave along with the sprouting jar. Thanks so much for mentioning the enzyme problem when making papaya gelatin. I'll be sure to heat it in the microwave and add an acidic fruit like orange juice, since I see recipes suggest adding lime, for flavor or other reason?? I'm anxious to try it with coconut milk and coconut extract which I bought at an Asian market for a lot less than McCormick. Since I'm hoping to keep the cost of our gelatin dessert to under 15 cents per serving, this requires perhaps using less real coconut milk and instead cows milk with coconut extract.